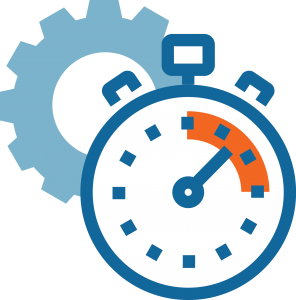 Did you know that you are 100 times more likely to reach a prospect if you respond within 5 minutes, and 21 times more likely to convert them to a client? That is because time is of the essence. When a prospect reaches out to you, they are actively engaged in the purchasing decisionat that time. That means that the sooner you respond to them, the more likely you are to catch them while they are still in decision mode. 35-50% of prospects go with the law firm who responds to them first. Wait too long, and their decision is likely already made, and probably not to your benefit. You are spending your hard-earned cash to generate more leads online, so why aren’t they being treated with the urgency they demand? 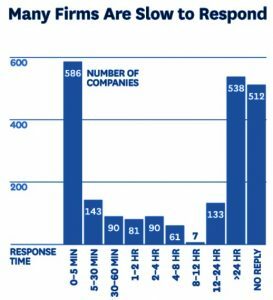 Only 37% of law firms are responding to leads within the first hour, with many not responding at all! The good news is that if you are able to respond quickly and engage with your leads within a few minutes of initial contact, you have the opportunity to outperform your competition. There are ways that you can improve your response time and increase your chances of converting more prospects into leads and clients. Round Robin or Dedicated Phone Lines: Having a plan in place for who will answer initial and overflow calls can keep them from going to voicemail. Many law firms have a single receptionist who answers the phones, but what happens when she is at lunch or on another call? Having a backup system in place can help to ensure someone is answering every single call, every single time. After Hours Answering Service: Many law firms keep business hours, however it is not uncommon for a potential client to need assistance at any hour. By utilizing an after hours answering service, you will no longer have to wait until the next day to make your first connection with the client, especially since conversion rates often increase on nights and weekends. Form Submission Management: Just as important as your phone calls are your form submissions. Make sure that form submissions go directly to the person who is dedicated to responding to those leads, and that a backup and follow-up system is in place so that those who you can’t reach right away don’t fall between the cracks. Setup a Follow-Up Schedule: You won’t always reach a lead when you call back. However, don’t take that as a loss. Continue to follow-up daily for at least a week after they have reached out to you so they have ample opportunity to take your call, and can see that you are dedicated and aggressive, which is exactly what they are looking for in an attorney. If you can’t answer your phone, find someone who can. If no one can answer your phone, make sure that follow up is done as quickly as possible. If you don’t reach them, keep trying. If you need assistance managing your leads and putting a process in place that works for you and your team, let us know. We can analyze your current process, and make recommendations for improvement and tools that can assist you with management of your incoming leads. Call us today at (877) 721-8491 to discuss how you can make the most of your leads. Now that you know the importance of answering the phone, it’s time to learn how to best handle lead phone calls.